Gone are the days where people wearing coats, gloves and nets in their hair, stood in a line counting/measuring and packaging nuts & bolts, grain, chemical, pills, food etc. Nowadays, factories, companies, assembly lines all automate for precision and efficiency. How? With feeders,conveying systems and other related equipments handling bulk solids. I find the business boring don’t you? Yet, I am excited by this boredom. K-Tron is engaged in one principal business segment, which is material handling equipment and systems, and their operations are conducted largely through subsidiary companies. They design, produce, market and service material handling equipment and systems. – The Process Group which focuses primarily on feeding and pneumatic conveying equipment. – The Size Reduction Group which concentrates on size reduction equipment, conveying systems and screening equipment. The feeding equipment, which is sold under the K-Tron Feeders brand, controls the flow of materials into a manufacturing process by weight (known as gravimetric feeding) or by volume (known as volumetric feeding) and is used in many different industries, including the plastics compounding, food, chemical and pharmaceutical industries. The pneumatic conveying equipment, which is sold under the Premier Pneumatics brand, addresses a broad range of pneumatic conveying applications that involve the handling of bulk solids. K-Tron Premier Pneumatics equipment and systems transport bulk solids from one point to another point with negative pressure (known as vacuum conveying) or with positive pressure (known as pressure conveying) and are used in many industries, including those served by the K-Tron Feeders brand. Servicing and Parts is also a part of the Process Group where a global service network responds to customer calls within 24 hours almost anywhere in the world. K-Tron also sell parts to customers, and their service and parts business associated with sales of the equipment is an important source of revenue. The K-Tron Electronics division produces and tests electronic assemblies. The design and production of products sold by K-Tron is done in house. I am confident in saying that K-Tron is as close to recession proof as they come. Although it isn’t a company that directly produces and sells necessities such as food, medicine, toilet paper etc, companies require feeders and conveyors to transport and control materials. People may shy away from Italian handbags and stallions, but food, pharmaceutical and chemicals are required by consumers. Due to this, look at the lack of correlation between K-Tron and the market. Additionally, for the past 6 years, the stock has been steadily moving on up without much notice. Well actually, the stock has been rocketing upwards and I don’t see any big firms or analysts covering K-Tron yet. With an average volume of 6000-8000, it is a very thinly traded and undiscovered company. K-Tron generated 36%, 34% and 38% of their sales overseas in 2007, 2006, 2005, mainly in Europe, with operations and manufacturing facilities in the United States, Switzerland, the United Kingdom and China and sales and service offices and representatives in more than 60 countries. They have expanded into China by purchasing certain assets of Wuzi Chenghao Machinery Co, a privately owned Chinese company in March 2007 that is targeted at the domestic plastics compounding and injection molding markets in China. This shows that K-Tron acts on its goal of diversifying into complementary products and new markets. Growth was partly organic and partly driven by acquistions but excluding acquisitions, in 2007, K-Tron was able to deliver a 25.6% increase in revenue and 70.6% in operating income from their Process Group but The Size Reduction Group increased slightly. K-Tron has complete control over the design and manufacture of its own weighing, mechanical and control systems. Their intellectual property as well as the ability to completely custom make solutions is a great plus. Holding more than 98 patents for weighing, mechanical and control technologies and their application to bulk solids handling further helps the cause, but it is stated in the annual report that even though patents are expected to expire soon, it should not have any adverse affect on the business. K-Tron is considered to be the leading producer of feeders and related equipment primarily because of the use of digital control technology and digital weighing technology, their development of mechanical design improvements to products and extensive knowledge of material handling applications. Both the feeding and conveying equipment industry have strong competition but because of the numerous types of applications and the requirement of specialized equipment to suit each need, these niche type applications provide plenty of business opportunities which K-Tron can capitalize. For a company its size, it has a surprisingly wide moat. With its large distribution and operations base spanning 60 countries, K-Tron is able to gain traction to penetrate into different markets. Also, due to the nature of the business, once a system has been either sold or custom designed, there is a high switching cost and most probably lots of anguish by the customer should they try to switch their equipment to another company. This also leads to a high barrier of entry. I believe that companies that purchase feeder and conveyors would pay the extra money to stick with the knowledge that they are in good hands. As boring as the business seems, there are still some risks involved but nothing overly worrisome such as a rapid industry, lack of moat or no cash. Competition is always a factor, but a specialized niche market won’t attract the big fish. K-Tron factors this in by acquiring companies both locally and overseas. As an industrial capital goods supplier, cyclicity may be an issue. During economic contraction or recession, demand would decrease. However, as intelligent investors, we know that contractions come and go, and it is the long haul that is important. The more important risk is the way K-Tron also tends to grow by acquiring businesses. The thing is, acquisitions don’t always work. Integrating two companies is a difficult process and if the two companies aren’t synergised, it could be a mess. Look at the mess Gary Forsee made at Sprint with the Nextel merger. Very high insider ownership. The CEO, Edward Cloues, owns 271k shares totalling 9.8% of the company. Total insider ownership comes out to 16.31%. It’s safe to assume that insiders definitely want to create shareholder wealth and their visions are aligned. For 2007, the CEO was paid a total of $1.5 million, but compared to the revenue of $202 million he helped orchestrate, I believe that he is on the “value” side of CEO pay rates with his pay being at 0.7% of 2007 revenue. Also, Im glad to see the company isn’t paying out money for personal yachts etc. I just can’t stand to see companies use shareholder money for a private jet or cruiseliner. Financially, K-Tron has some very impressive numbers. For the past 10 years the average numbers were as follows; gross margins constantly above 40%, operating margins around 10%, ROA at 8% and ROE at 20% and CROIC at 11.6% which is higher than the current 6% interest on debt they are paying. Meaning, K-Tron was able to make around 11c cash for every dollar invested. 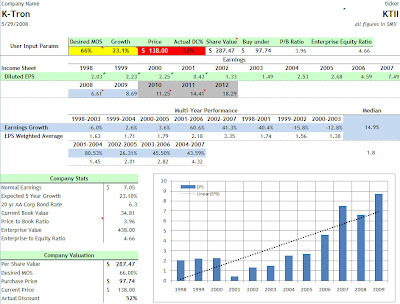 Refer to the image below to see the financial performance for KTII from my intrinsic value spreadsheet. For KTII, Morningstar has the wrong values for the number of shares outstanding so I corrected the numbers from those in the annual report to get the correct historical shares outstanding. 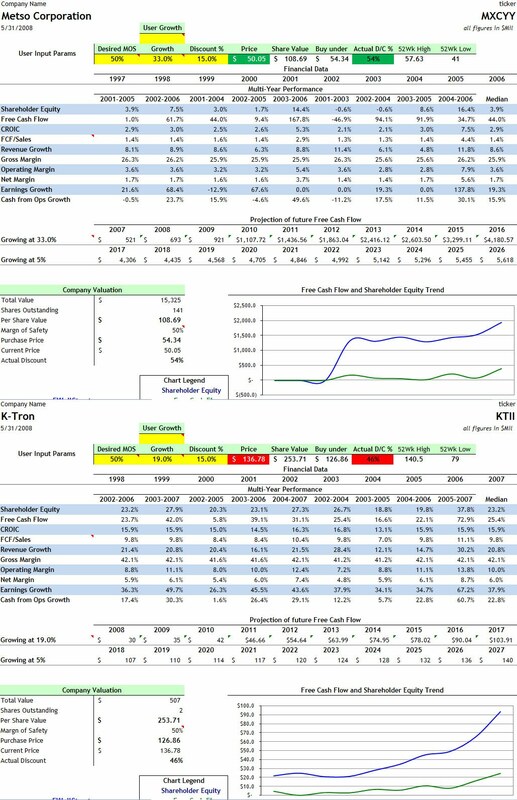 10 years of data shows me that K-Tron has been able to generate FCF at 30% annually. Will it be able to continue? I don’t know, but considering that K-Tron is a boring business without too much “change” in the industry, I don’t see why it can’t grow at 23%. Revenues have been growing at 60% year over year and other growth aspects are excellent. Price wise, it seems like it is currently trading at a 38% discount to its intrinsic value. Basically, selling at roughly 60c to the dollar. Not the 50c that I like, but a good, stable, long term business at 60c sounds pretty good to me. Refer to the Wrigley’s example to see why Wrigley’s would have been a good investment if you were long from the early stages. However, don’t let the share price of $138 throw you off, the market cap is only $375 million so there is plenty of growth available. The past 6 years have been incredible for K-Tron, yet there are no analysts following the stock. High stock price and low number of shares may be a reason why K-Tron doesn’t have the recognition it well deserves but I believe that K-Tron has the capacity and ability to hit the radars of the big boys. With so little information available on K-Tron, I’ll be providing updates when I can but this is a company that bores me to sleep. At least when I wake up in 5 years, I’ll be very happy. So far I have found 2 blogs who also posted something on K-Tron (broken links). Everyday Finance; K-Tron: A Diamond in the Rough You’ve Never Heard of. Mongaup Investing; K-Tron (KTII) (Price: $138, Intrinsic Value: $165). This blog shows KTII to be 52% overpriced which I find hard to believe after looking at their other calculations. Who are the competitors in K-Tron’s “niches”? How big is the market for these niches? Can they grow at the present rate without hitting some sort of “limit”? There are some strong competitors producing similar products, such as Afag (http://www.afag.com/en.html) in pneumonic handling and feeding and Metso Minerals (http://www.metsominerals.com/) in crushers. What will keep them from entering K-Tron’s niches, given their large resources? As K-Tron grows to the limits of its niches, how can it enter into other areas and compete with these guys? Industrials like K-Tron are interesting, but I’m not great at forecasting growth… especially whether they will continue to the same growth prospects in 5-10 years and warrant a similarly high P/E. Thanks for your questions. It really got me thinking and I had to do much more research. So here is what I’ve gathered. Please correct me if I am wrong. After reading Metso’s form 20F, they are more of a “product-oriented” company and looking to become a “service-oriented” company. K-Tron, with its smaller size has always been focused on service as part of their main business. Also, Metso is a company that deals with a lot of full scope systems. By that I mean, they supply everything from A-Z for a customer. If a new site with tons of minerals have been found, Metso will provide all the equipment for on site crushing, transporting etc. K-Tron on the other hand, helps by providing more efficient, less overhead (smaller,functional) equipment that can replace big overly bulky and inefficient equipment in a system such as Metso’s. K-Tron’s equipment aren’t normally used in quarries but in factories, plants and mills where materials are ground to a pulp and made ready for commercial shipment. By helping companies increase efficiency and thus helping them make money and recognizing that the “after business” i.e. servicing is just as important, K-Tron market niche is quite large indeed. Why? Their recent expansion into China and hopefully into emerging countries, where industrial growth is a requirement will definietly provide plenty of growth opportunities. What I like about K-Tron is that they aren’t focused on just one line of business. They exercise their strategy to expand into related businesses. This can be seen by their vast product lines of systems including linear feeding systems as well as vacuum systems, liquid process control and loss in weight feeders. Afag on the other hand seems to deal with dry bulk material only such as tiny springs for watches, mobile phone volume keys, lids, covers, fuses and so on. Notice how they don’t have applications for things such as precise measurement of pills, grains, liquids etc. So it seems like Afag is in the same industry but contrasting applications. Afag also seems to emphasise business in the sales of parts and components. Im no fortune teller myself and I can’t predict the growth but I do see that growth in other countries in the US provide excellent opportunity for K-Tron. 36% of their sales came outside the U.S. and I wouldn’t be surprised to see that number grow further. And out of curiosity, I did a comparison between Metso and K-Tron from 2000 onwards. You can see it here. Note the numbers are overwhelmingly in K-Tron’s favour. Metso just seems to be hoarding cash and not using it effectively for some reason.. Thanks for your questions. Made me rethink a lot of things. You’ve done quite a job analyzing K-Tron. I don’t mean to discourage or discredit your analysis. It’s just that I’m paranoid about forecasting high growth rates. BTW, what time did you post to your blog? Could your post have caused the “pop” towards the close of trading on May 29th? I wasn’t trying to defend myself or anything. In actual fact, your questions made me realise that I didn’t completely think everything through. I should just append what I wrote into the post haha. I need questions like yours so that I dont get stuck in a rut. High growth rates aren’t really a thing with me as well. 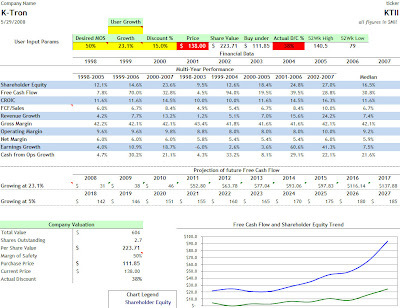 But I believe this is a good company with a moat wide enough to yield enough capital gains over many years. Currently, it may not be a cheap stock but I’m looking forward to the long haul on this one. An article on Forbes about KTII that is pretty much in line with what I had in mind pluss more background. Great information here.